Thanks to the successful Kickstarter campaign we raised enough money to make it happen. But we still need a little push to make Blood Machines as great as we picture it! So, feel free to pledge via our ONLINE SHOP! Blood Machines is a visually spectacular science-fiction short movie/music video with the music of French electro artist Carpenter Brut. Inspired by the 80’s, Synthwave and classical ScFy movies. It is an originally and visually ambitious Science Fiction short movie written and directed by Seth Ickerman, a collective composed of Raphaël Hernandez and Savitry Joly Gonfard. With the support of Carpenter Brut, the short film is a sequel to the clip Turbo Killer and makes you get a deeper step in this universe. WHY THIS PROJECT? After the success of Turbo Killer (more than 1 million views), we wanted to create a sequel to the clip with Carpenter Brut. Something bigger, better, and increasingly cooler. You asked for more, and we were ready to give it to you as we fully enjoyed doing this. Blood Machines is our most ambitious project so far. OUR AMBITIONS We love the music videos from the 80’s so much - thanks to artists like Michael Jackson - that we find it hard to get excited about today's music clips, which tend to be formatted promotional tools. United by our passion for the 80's, we naturally met with Carpenter Brut and gave birth to the clip of our dreams: Turbo Killer. Only a small piece of a bigger project, Turbo Killer laid the foundation of a universe that Blood Machines will continue to explore. Blood Machines will be more ambitious than our first collaboration. For Turbo Killer, we used a rather classical music video structure. For Blood Machines, we would like to get closer to a cinematic narrative and develop a film structured around musical sections. 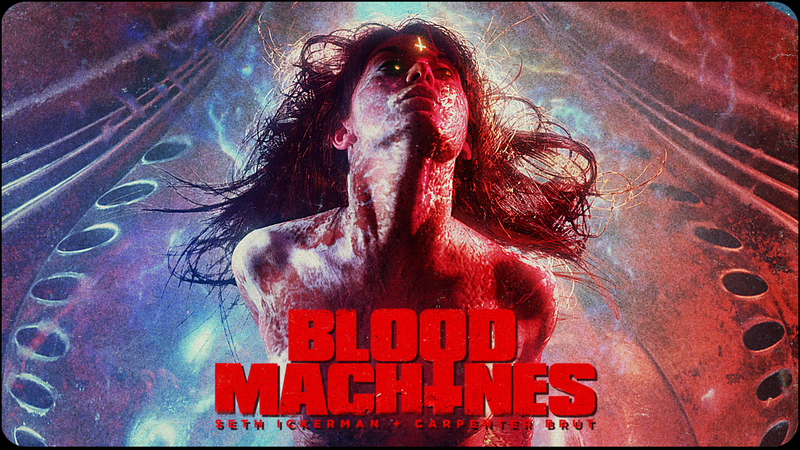 In a mix of genres inspired by many Sci-Fi and horror films from the 80’s, Blood Machines will have more density. We want to take the audience to a universe filled with adventures, epic images and musical action scenes - and by doing so, offer them a true spectacle!!! THEMES As we experience the ever-growing interdependence between man and machine, our connection to machines is increasingly filled with emotions. With the development of artificial intelligence, machines can now have complex behavior. Some people imagine that machines have a conscience and the more spiritual will believe they have a soul. Blood Machines will deal with this universal theme. Even though these questions have been treated many times before, they are now more relevant than ever. At the time of his death, Roy Batty, the replicant from Blade Runner, lets a dove fly away. As a symbol of his soul, the bird takes off to the sky. This poetic moment perfectly illustrates the beginning of our film. In a metaphoric way, Blood Machines begins where Blade Runner leaves off. Determined to follow the dove, our heroes will start a journey through the skies, which quickly fall into darkness --- tormented by the devilish music from Carpenter Brut!!! Present in TURBO KILLER, Mima is the female ghost escaping from the machine, leading the space hunters' chase. She is a breathtakingly beautiful creature, transfigured by an unreal sensuality with graceful gestures. Lago is the partner of Vascan in the spaceship. In his late 60's, with a big white beard and a face wrinkled by the passing of time, Lago is a veteran full of wisdom and empathy. As a mechanic, he looks after the machines and develops a special relationship with them. Lago is a sensitive man inclined to spirituality. At the end of his life, he wonders about the afterlife. 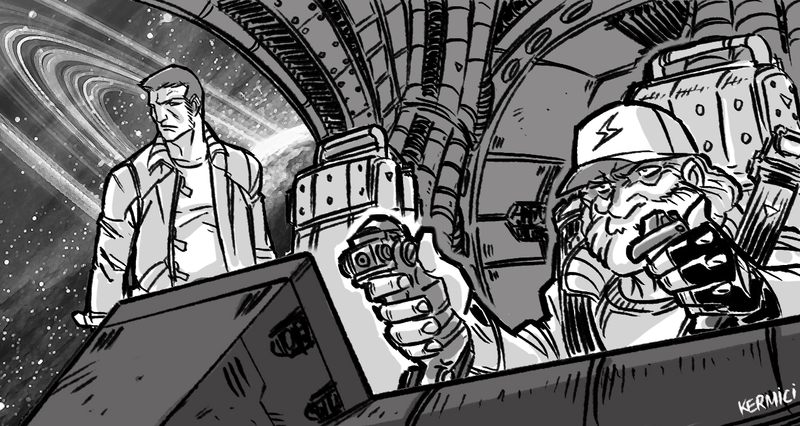 Captain of the spaceship, Vascan is a "blade runner" who tracks down machines taken over by its artificial intelligence. In his 40's, he can be quite brutal as he takes pleasure in abusing and humiliating the machines. When the story takes a supernatural turn, his rational personality prevents him from having any fear. An ambitious and talented hunter, he will not hesitate to risk it all in order to reach his goal. Coré is a strange priestess who protects the machines. She leads a group of priestesses with an iron fist. Still, behind angelic features, Coré may hide a part of darkness. We are two French directors, working for more than 10 years under the pseudonym of Seth Ickerman. We started with the 50-minutes film KAYDARA, inspired by The Matrix’s universe. Produced with limited budget, Kaydara attracted a large audience when we released it online. Since then, we worked on various projects as directors for companies like LG, Ubisoft and Samsung, and directed the music video Turbo Killer in 2016 for Carpenter Brut. We are now developing our first science-fiction feature film ICKERMAN. We released online a proof of concept of Ickerman early this year which did more than 1 500 000 views online. In 2012, Carpenter Brut releases EP I. His success was striking, especially with the music video Le Perv, a tribute to Fabio Fulci and the 80's slashers. After EP II, marked by Roller Mobster, Carpenter releases EP III closing his trilogy. Turbo Killer is part of this last opus and Seth Ickerman’s music video is a true synthesis of Carpenter Brut’s universe, developed through the three albums. Carpenter Brut was influenced by many 80's TV shows and B-movies stuffed with synthesizers. Surrounded with mystery, the man represented by a Pentagon is paying a homage to the post-hippies, metal and electro culture, with a unique and striking sound. One of the leaders of the retro new wave, his music is also present in many famous video games such as Furi, Hotline Miami 2: Wrong Number and The Crew (Ubisoft). Traditional investments come with conditions and one of them is giving away creative control. We want to retain control on BLOOD MACHINES. We know what the film has to be and we need to be able to set a certain ambition with our own vision. Our first goal is to produce a 30-minutes short film but, depending on the success of the Kickstarter campaign, we are open to go further with a Virtual Reality (VR) experience in addition to the classic version - and, maybe, a full length feature à la Interstella 5555 by Daft Punk. Producing such an ambitious project today is almost impossible based on the music and film industries' standards. As synthwave is labelled as a fringe retro movement, it's complicated to raise funding from traditional sources. The industry starts to understand the revival of the 80's but they want to see big names attached (such as actors) and we remain young directors. Putting Blood Machines on Kickstarter is a way to give everyone an opportunity to get involved. It was born on the internet with the interest behindTurbo Killer. Without your support, Blood Machines would not be here. No matter the outcome, we just want to say thank you to everyone who took the time to watch our work and support us. That's why Kickstarter is the best way to get people interested and involved in BLOOD MACHINES. It's the direct link between the filmmaking process and those who might be interested in participating. That's why we need your support as you have the power to change this. Sometimes we feel alone in our garage but we know you are around, sharing like us an intense love for the 80's!